Have you ever looked up into the trees and wondered what was going on up there? 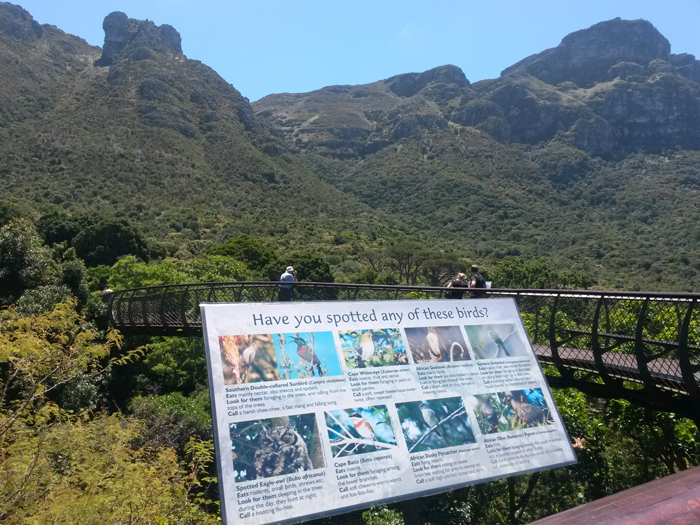 Kirstenbosch shares some insight into tree canopies through their interpretive educational signage and Boomslang canopy walkway. The highest layer of a group of trees is called the canopy, encompassing the parts of the tree (branches, twigs, leaves) but also the ferns, mosses, lichens and climbers that grow in trees, and all the creatures that live in them. These are hidden treasures of biodiversity and areas we seldom get to see and explore. The tops of the trees are in full sunlight. Trees position their leaves so that they maximise the light that reaches them. 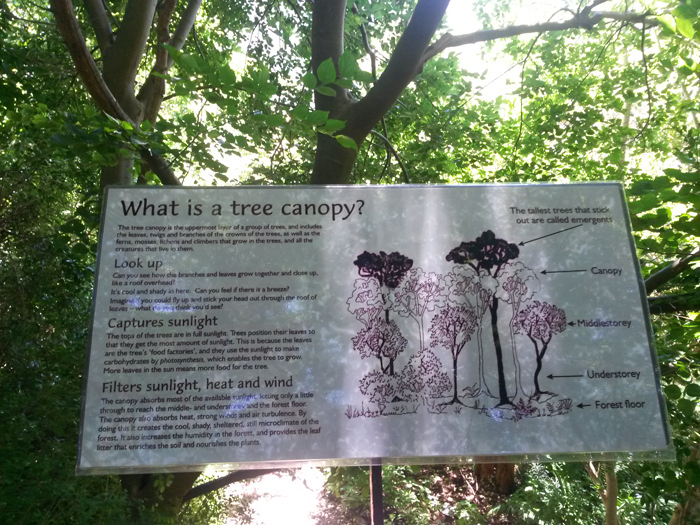 This is because their leaves are the tree’s ‘food factories’, and they use the sunlight to make carbohydrates by photosynthesis, which enable the tree to grow. More leaves in the sun means more food for the tree. The canopy absorbs most of the available sunlight, letting only a little through to reach the middle and understorey, and in turn the forest floor. 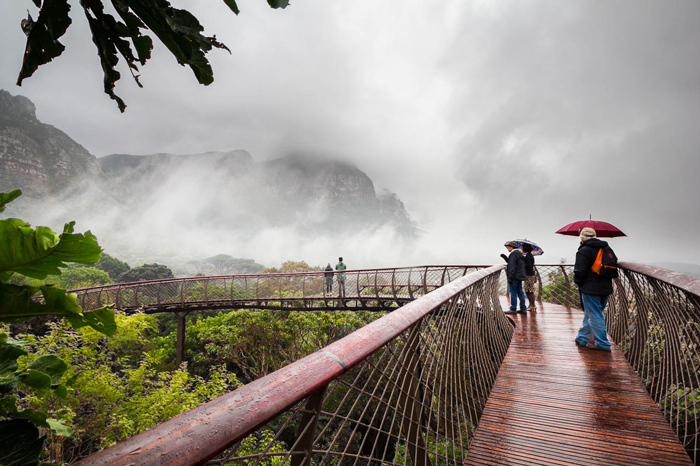 The canopy also absorbs heat, strong winds and air turbulence. By doing this it creates the cool, shady and sheltered microclimate of the forest and increases humidity in the forest, while providing leaf litter that enriches the soil and nourishes the plants. 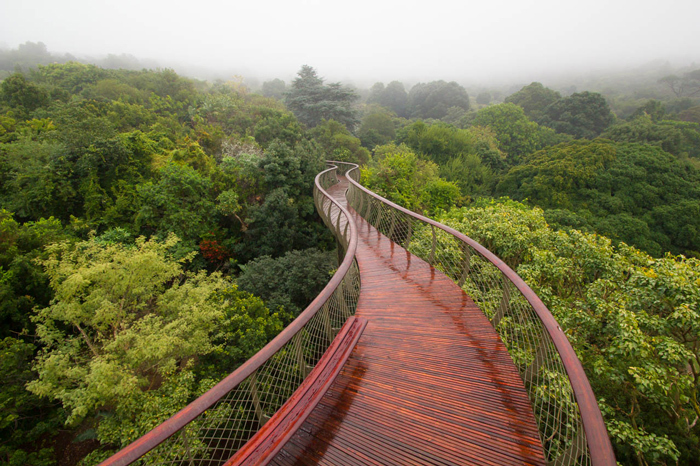 Something incredibly special allows us a sneak peak into this world: the SANBI Kirstenbosch Centenary Canopy Walkway, the ‘Boomslang’. The tree canopy is an area that supports many creatures and provides food, shelter, hiding, resting, nesting places and homes. 1. Butterflies, bees and other winged insects can be found in the canopy hanging around the flowers and fruit, either to find food or to lay their eggs. 2. Before it becomes a beautiful butterfly, it was a caterpillar. Caterpillars can be found munching on the leaves of the canopy. 3. Birds calling or moving about in the trees and birds’ nests in the crooks of branches. Many birds take shelter and build their nests in trees while owls take shelter and sleep in trees during the day. 4. Geckos hide under the bark and in the crevices of the trees during the day, coming out at night to hunt insects. 5. Spiders in their webs strung between branches. Orb-spiders spin webs between the trees to catch their insect prey. 6. In the canopy you often have to watch out for snakes! You will always know where the snakes are because the birds will be in a flap. Most tree snakes are not aggressive or dangerous. 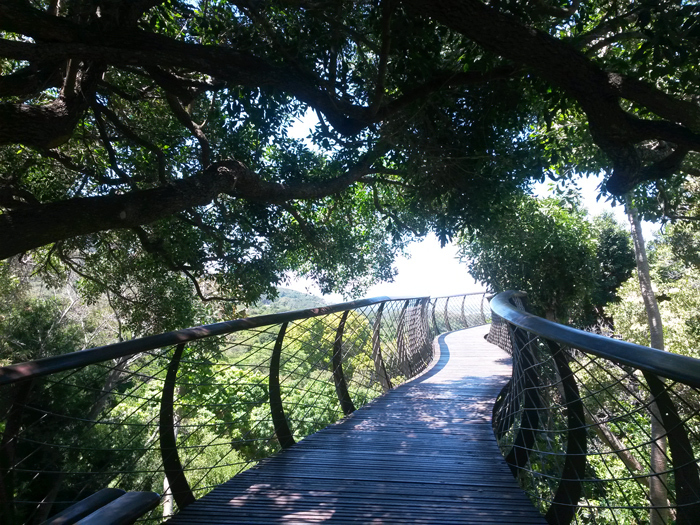 The boomslang (tree snake) hunts in trees during the day and feeds on geckos, bird eggs and frogs. 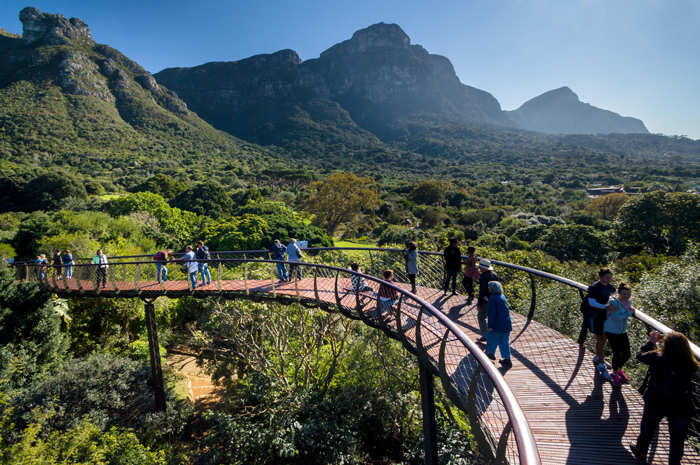 This is the snake that inspired the Kirstenbosch Canopy Walkway and the structure reflects its skeleton moving through the trees. 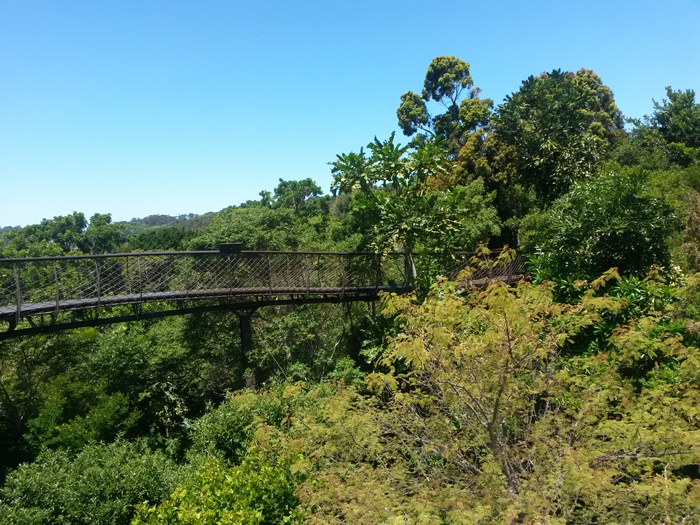 Members of the Botanical Society of South Africa enjoy the benefit of free access into all SANBI National Botanical Gardens – so by becoming a member, you could visit and enjoy exploring the ‘Boomslang’ canopy walkway as often as your heart desires, as well as all of South Africa’s other national gardens. 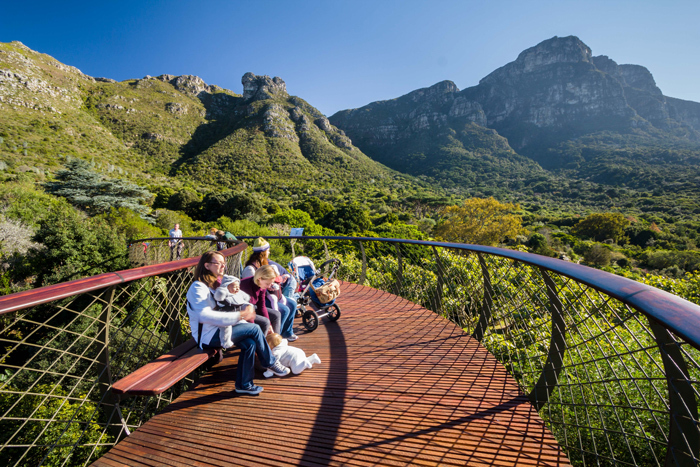 The Botanical Society supports all SANBI gardens, and donations and support can be made to the partnership fund specified for use in the garden(s) of your choice. 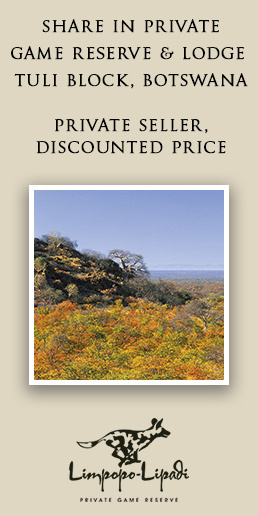 You can also support the society by getting your MyPlanet card today and making the Botanical Society your beneficiary. This is a free and easy way to support the society. You apply and set up your chosen beneficiary, a card is issued to you and you simply swipe it when you shop at participating outlets, earning your beneficiary funds.